In the darkness, it's easy to lose your way. 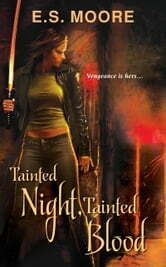 . .
Kat Redding is a vampire with a job to do--wiping out the vamps and werewolves who prey on Pureblood humans. Someone has to do it. . .as long as that someone is her. But suddenly Kat, also known as Lady Death, has competition, and it's causing problems. Vampire houses and werewolf clans alike are blaming her for a spate of gruesome murders, and Kat needs to figure out who's really responsible before she becomes the next target. . .
On the hunt, she forms an uneasy alliance with both the Luna Cult and a powerful rogue werewolf. But the truths Kat's uncovering--about her enemies and her few remaining confidantes--are far from comforting. And when the chance comes to leave her life of vengeance behind, Kat must decide whether her real motive lies in protecting the innocent, or sating her own fierce hungers. . .